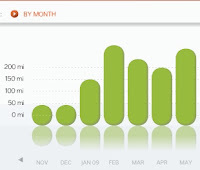 Just ten more miles and I will beat last February for the most miles. How many times in the last year have I used that phrase to get me to walk a little bit more? I have to admit that it seems to work for me. This afternoon, I went for a short walk on the UAF ski trails behind West Ridge. I would've gone a lot further than the 4 miles if it didn't start raining but other than a little drizzle, no complaints at all. Some parts of the trail were kind of wet but not swampy. I opted not to go all the way around the T-Field since the southern end is almost always wet even near the end of the summer. The Baseline trail was pretty wet so I didn't go to lower campus along that route and just took the Skarland Trail like I had earlier in the week. The mosquitos were starting to come out with the high humidity but nothing like it was earlier in the Spring. I think the little cold snap killed a lot of the larvae. There were only a couple of other walkers and runners out on the ski trails today probably due to the threatening weather.